awesome! I'm still euphoric....maybe these will motivate me to make some cards? Those are pretty sweet. Thanks for sharing. Jess, I don't comment often, but you're in my reader, and I enjoy what you put out there each day. I love these and thanks for posting them. Anon, sorry. But you gotta admit the artist who made these did a really good job. Yeah, I'm not happy either. I'll have to live with it but I won't enjoy the next four years. I DO enjoy this blog however and so I thank you for all of your creativity! I agree with you Michelle!! (oops, typo in that last attempt;-)! Hey, Jess – got my items from your etsy store: so very nice; I am going to enjoy them very much. Your mum is a good seamstress, too! Hello, Grandma G! Hi Elena! Thanks for buying my bag... I'm glad you like it! I have to agree with Michelle, but my daughter-in-law will love these. And yes, the artist who made them is great. 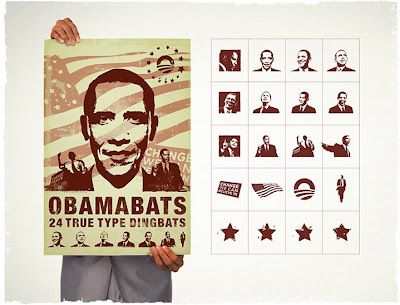 I appreciate design as much as the next person, but it's scary that people idolize a human being, let alone a politician. It reminds me of the iconic image of Che Guevara, who sent children to die by firing squads. Think I'll stencil some on my toilet seat! And how come every time I type Obama, I always hesitate for a nanosecond after the O because I instinctively think I'm supposed to add an apostrophe?! O'Bama!?! What, like he's Irish? Where does that reflex come from? Stencils are cool, but having them of someone's head is not so cool. Maybe if it was like Abe Lincoln or George Washington who proved themselves, but we've yet to see if this guy is stencil-worthy. Regardless of political views, we know nothing of this man yet. Everyone sounds great during their campaign. Is this guy going to be the president or is he a New Kid On The Block or Backstreet Boy? What do you actually understand of his politics? Welfare expansion? Unrestricted, tax payer funded abortions? Enough of the tote bags, fonts, posters, etc. of the president elect. He's not a pop star. He's a politician. Everyone’s a pop star in this day and age. Art is a form of expression. These are amazing!